We are looking at Saturday's MLB action in this space but would be remiss if we didn't mention Clayton Kershaw's expected season debut Monday for the Dodgers. While the future Hall of Famer is clearly no longer at his three-time Cy Young peak, Los Angeles isn't winning its first World Series since 1988 without him. On Tuesday in Triple-A, Kershaw made his second minor-league rehab start (shoulder inflammation) and threw 81 pitches in six innings, striking out six. Kershaw's fastball sat from 88-90 mph and reportedly reached a high of 92 - but he hasn't been hard thrower in a few years. 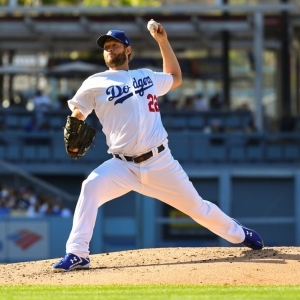 This is the first time in Kershaw's career he has begun a season on the injured list, although he has been a frequent visitor during the past few seasons. Kershaw is set to pitch in Monday's series opener against the Reds - there was some consideration of him going in Sunday's series finale against the Brewers. Manager Dave Roberts said he does not anticipate any restrictions for Kershaw on Monday. A 1:05 p.m. ET first pitch on the MLB Network. The Red Sox might want to get well in this series (concludes on Monday with annual Patriots' Day game) because next week they go to the Yankees and AL East leader Tampa Bay. It's former Cy Young winner Rick Porcello (0-2, 13.50) for the Sox and that Cy continues to look more and more like a fluke. Porcello has been bombed for 16 runs and 16 hits over 7.1 innings thus far, although this will be his first at Fenway Park. He was 2-0 with a 2.25 ERA in two starts vs. the Birds in 2018. Baltimore's Andrew Cashner (2-1, 5.28) has been roughed up in two of three starts. He somehow avoided the Red Sox last season. Xander Bogaerts is 3-for-6 with a homer against him. Key trends: The Sox are 1-4 in Porcello's past five at home vs. Baltimore. The "over/under" has gone under in five of Porcello's previous seven in the series. Early lean: Orioles on runline (absurd the Sox favored that much) and over. Also starts at 1:05 p.m. ET and it's former Yankee Ivan Nova against big lefty CC Sabathia (9-7, 3.65 ERA in 2018), who makes his season debut. The Bombers really need Sabathia with their starting pitching woes and ace Luis Severino now potentially out until the All-Star break if not longer. Sabathia has been out due to a five-game suspension for throwing at Jesus Sucre last September and then rehab from offseason heart surgery. Sabathia looked good in his lone rehab start with Class A Tampa last Sunday and his return should send Jonathan Loaisiga back to Triple-A. Chicago's Jose Abreu is 0-for-9 career off Sabathia. Nova (0-1, 7.71) was acquired this offseason from Pittsburgh. He was excellent in his White Sox debut but crushed last time out by the Mariners. The Yanks' DJ LeMahieu is 5-for-7 career off him. Key trends: The Yankees are 5-2 in Sabathia's past seven vs. teams with a losing record. The over is 4-1 in the White Sox's past five vs. a lefty. Early lean: White Sox on runline and over. Game gets underway at 2:10 from Target Field. The Tigers signed veteran Tyson Ross to a one-year deal this offseason in hopes of flipping him to a contender, and Ross has been pretty good in two starts with a 2.25 ERA and 1-1 record. The long-time National Leaguer hasn't faced the Twins since 2014. Jonathan Schoop is 2-for-2 with two RBIs against Ross. Minnesota ace Jose Berrios (1-1, 2.18) has thrown a quality start all three times out but was a tough-luck loser last Sunday in Philadelphia, allowing just two runs on two hits over six. Berrios is 3-1 with a 7.06 ERA in 29.1 career innings vs. Detroit. Nicholas Castellanos is 5-for-13 with a dinger off him. Key trends: The Twins are 21-5 in Berrios' past 26 at home. The under has hit in his past four at home. If you saw any highlights of Kansas City's game Thursday against Seattle, it sure looked like Billy Hamilton was seriously injured in an outfield collision, but an MRI has revealed only a knee strain. Hamilton, the former Cincinnati Red, can't hit a lick but is probably the fastest player in baseball (thus steals plenty of bases on the rare times he gets on) and is a terrific defender. It's the horrific Homer Bailey (0-1, 9.00) for the Royals. I don't understand why MLB teams keep putting the 32-year-old out there after he was historically bad last year for Cincinnati before being traded and then released. Bailey has allowed 10 runs and 13 hits over 10 innings this season. Cleveland's Jose Ramirez is 2-for-6 with a homer off him. Jefry Rodriguez makes his Indians debut after going 3-3 with a 5.71 ERA in 52 innings last year as a rookie with Washington. He's being called up to take the place of Mike Clevinger, who could miss two months. Key trends: The Indians are 5-2 in their past seven on Saturday. The over is 7-1 in Kansas City's previous eight vs. a right-hander. Early lean: Indians and over. Matchup of former Cy Young winners in Justin Verlander and Felix Hernandez, but only one of those guys is aging well. That would be the 36-year-old Verlander (1-0, 4.24), who was of course second in last year's Cy Young voting. He has three starts under his belt this season and two were quality. Last year, he somehow faced division-rival Seattle just once and allowed six runs and three homers in two innings of a loss. New Mariner Edwin Encarnacion can't hit him much, going 4-for-35 with seven strikeouts. Hernandez (1-0, 4.26) pitched on his 33rd birthday Monday and lasted just an inning due to the stomach flu and allowed two runs and three hits in Kansas City. King Felix is 1-4 with an 8.56 ERA in six starts vs. Houston over the past four years. Jose Altuve is a career .483 hitter off him in 29 at-bats. Key trends: The Mariners are 4-1 in Hernandez's past five at home in the series. The over is 8-3-1 in his previous 12 vs. Houston. Early lean: Not sure why this opened as TBA. Like Houston, which will be favored, and over (probably total of 9).